Situated on a small, narrow and sloping block, this classic Sydney terrace originally had two bedrooms at the front, a living room in the middle, and a kitchen, bathroom, and pokey third bedroom at the back. The terrace stepped down the sloping block with the rooms in a linear, disconnected configuration. For a growing family, this humble home was in desperate need of an addition! 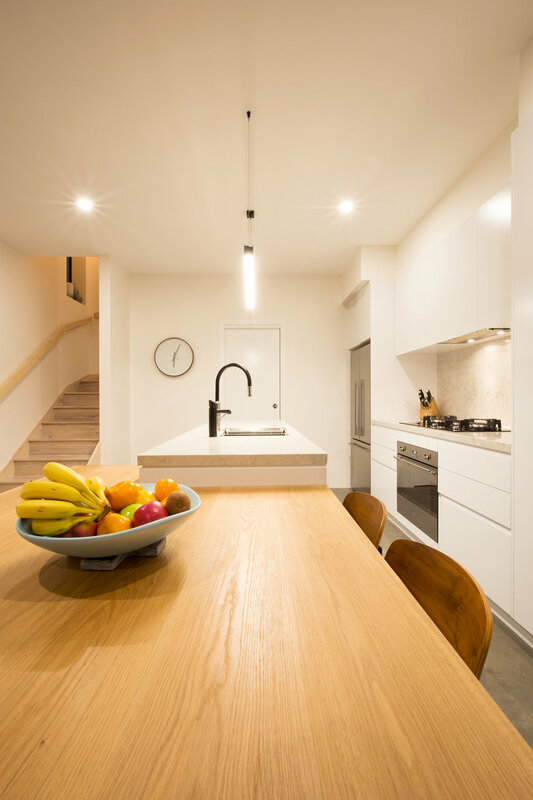 The narrow footprint and council’s height restrictions challenged the new design, but the Architect, Luke Van Jour, drafted a clever, split-level floor plan. The sloping block was excavated to provide a lower level partially set into the ground. This new two level layout allowed for a master bedroom, ensuite, and bathroom upstairs, and a living, kitchen, and alfresco area downstairs. The original front bedrooms and living room were retained. 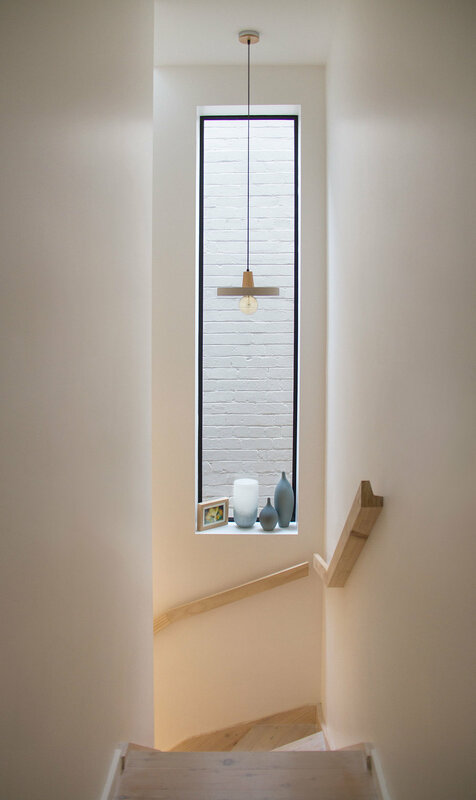 The extension was built with tight consideration to maximising space. Large glazed openings now give ample light to every room, and flush detailing used throughout creates the illusion of additional space. 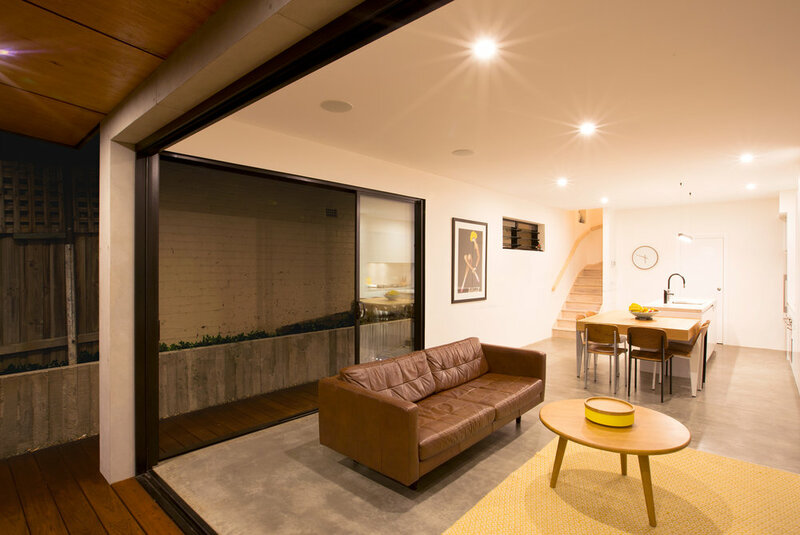 A pair of large stacking doors were installed to connect the alfresco to the living area – the perfect way to gain extra space in the warmer months. A combination of concrete panels, plywood linings, and zinc look-a-like cladding wraps the exterior and is enhanced by bold, black framed windows and doors. The thematic material palette continues inside with polished concrete floors, grey ceramic tiles, and timber, and metal highlights throughout. Concrete pendants, black bathroom ware and timber furniture tops off the minimalist industrial style.